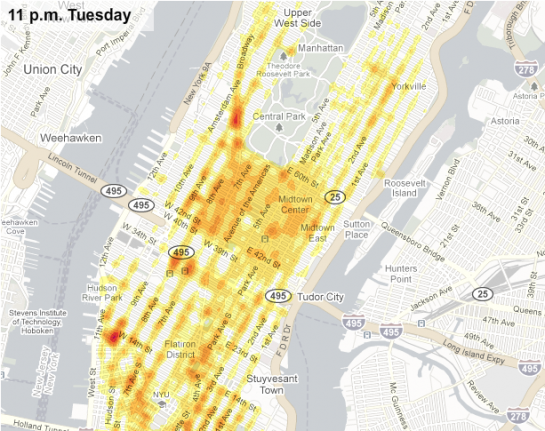 Nathan at FlowingData.com posts a nice collection of traffic mapping examples. We don't often get to see how cars, trains, subways, airplanes, etc move in physical space, because, well, we're usually in them, so it's always interesting to see the big picture. The activity feels very organic as traffic peaks during rush hours and slows down during the night, taxis provide service to and from the airport, and air traffic continues into the late hours. 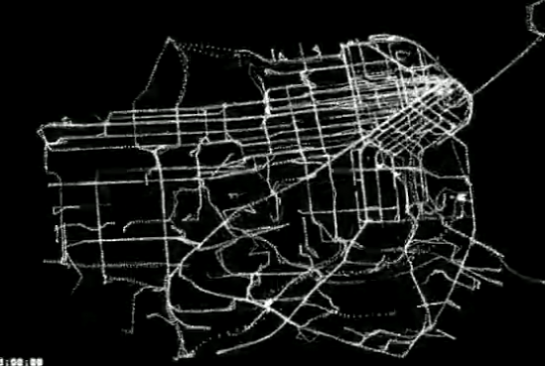 The maps pulsate with energy. 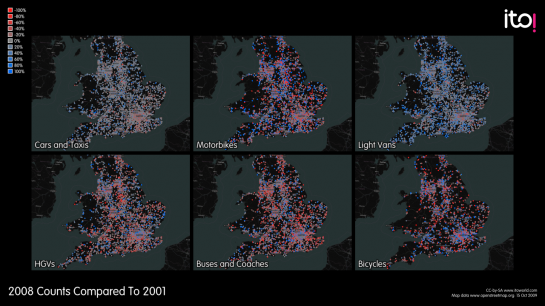 Let's take a look at some of these great traffic visualizations, some new and some old. 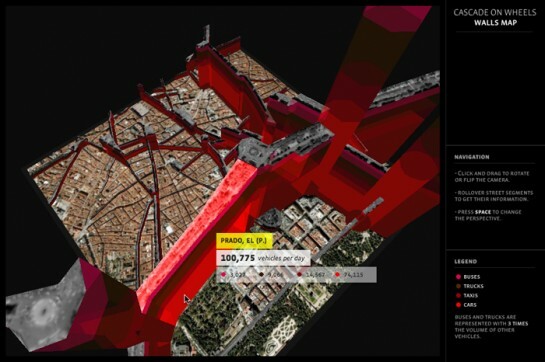 Pedro Cruz's maps showing traffic in Lisbon (above) are the most recent on the list. They're another take on the ghostly trails aesthetic. Areas turn bright when there's more activity. Watch the animations play out over time. Sha Hwang, now a part of Stamen Design, spun off of the fruminator's subway sparklines with a Modest Maps rendition of NYC MTA Ridership. Tracks get thicker with amount of estimated riders. Obviously, there's some interpolation going on. Of course we can't talk about traffic visualization and maps without mentioning Stamen Design's Cabspotting. 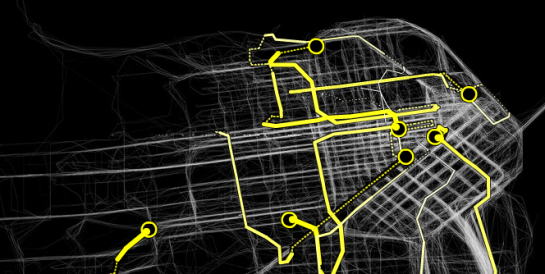 Launched way back in 2006, previous cab trails are drawn in the background, with current cabs driving around the city. 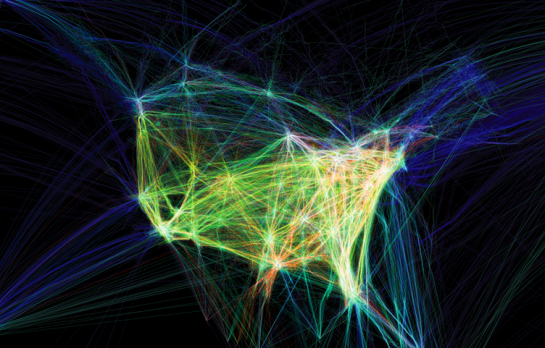 Finally, we can't forget Aaron Koblin's Flight Patterns, which (obviously) shows a day of flights in the United States according to an FAA dataset. 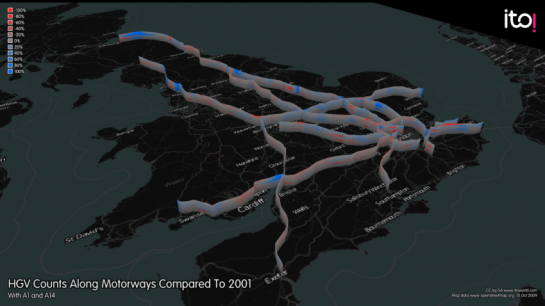 It won a first place prize in the 2006 NSF visualization challenge.